Campaigners have been calling for it for months, but now senior Tories are agreeing that the health bill should be scrapped and that Andrew Lansley must go. As doubts about the bill grow, Carl Packman reflects on what we might be able to learn from Lord Crisp’s account of NHS reform from 2000-2006. 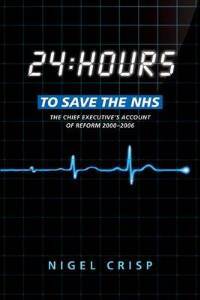 24 Hours to Save the NHS: The Chief Executive’s Account of Reform 2000-2006. Oxford University Press. September 2011. On the eve of the 1997 general election, Tony Blair told voters that they had “24 hours to save the NHS”, promising to cut waiting times by 100,000 and vowing never to take the NHS back to its dark days in the 1980s and early 1990s. As Chief Executive of the NHS from 2000 through to 2006, Lord Crisp guided the NHS through Blair’s promised era of deep and important reforms, and in this account he discusses how the Service needed more than just bandages to recover. Under Crisp’s guidance, The NHS Plan of 2000 was rolled out, with health secretary Alan Milburn introducing an increased private sector presence in an attempt to strengthen the Service. By 2001, shifts of decentralisation, outsourcing and financial incentives had crept in to its daily running. As this shift took place the power of the Minister increased, management became depoliticised and subsequently there was an evident removal of local political interests in the health service. With so many adjustments, the public didn’t see the immediate positive changes it had hoped for. With the press covering this disappointment and with pressure coming from all political sides, Lord Crisp had a challenge on his hands indeed. Crisp acknowledges the dismissal and criticisms of ‘The Plan’, but insists that he was merely trying to effect a vital and long overdue culture change. One of the things he felt as terribly debilitating was the language barrier, which was one effectively of private sector language and public sector ethos. The Commercial Advisory Board, with Crisp’s successful intervention, assisted early on so that the barrier between public and private cooperation was lowered. A key Crisp example of innovative reforms is the Independent Sector Diagnostic and Treatment Centre. The first initiative of its kind, it represented the point where private sector competition in the health service became permanent. The author notes that at the time he heard the sniggers as he was walking by, mutterings about one “old Labour” figure who was altering the NHS beyond recognition. Today, health secretary Andrew Lansley plans for all hospitals to be Foundation Trusts by 2014, while the professionals inside them are permitted to raise 49 per cent of their income through private healthcare. Critics thought badly of the two-tier system they saw beginning to grow in the early 2000s, and so rightly despair at the picture that Lansley yearns to paint. Let us also remember that the NHS was supposed to be the thing that tore up the coalition government. Yet it may well have escaped memory that it was Baroness Williams who was behind the 49 per cent idea; as health blogger Richard Blogger puts it, if the proposal led to friction within the coalition then there would also be friction internally for the Liberal Democrats. As he goes on, unless it is foreseeable that 49 per cent of British patients will choose (and he means really choose, in spite of options) to have private treatment, then the health system under these proposed reforms will be ripped literally into two. Nobody in their right mind, however, should withhold criticism of the NHS in its current state. Waste still needs to be tempered and spending better tailored. The National Programme for IT (NPfIT) has lately become a focal issue of the previous administration’s excess. Few criticised the programme (except figures such as Richard Bacon MP) before the National Audit Office reported that if payments on it continued it would amount to a huge waste of money for the taxpayer. Lansley couldn’t wait to pull that brake – it made him look bold (a tough job at the moment) while causing embarrassment to the last Labour government. Of course, under Lord Crisp, NPfIT was seen as a fascinating achievement, and he says so himself. The department had identified £208m it had made in savings and £1.1bn pared from running costs over a 10 year period from 2003. Crisp’s real achievement was in securing more NHS funding and making the health system in general look respectable again – and one can only believe the stories he recalls of impressed patients approaching him to ask the way out of the private patients’ departments, only to find, to their surprise, that they were in NHS patients’ departments all along. Crisp is clearly proud of the fact that many people went back to NHS care from private care over his term – and so he and the Labour government should be. Furthermore, it is also worth noting that the NHS became something all parties fought for credibility over, rather than distancing themselves from it. But public health care still had its problems. There was no growth in the NHS’s ambitions and no signs of it to come, unlike in previous decades. A private sector presence may have been a boon for some parts of the service, but other experiments such as the PFI projects did not fare so well. Today this mixed picture is bolstered further. SpitefireHealthcare, which runs 37 private hospitals across the UK, saw a 10 per cent year-on-year increase in ‘clinically-necessary procedures’ last October. And on the other hand, questions are raised about how viable a free-at-the-point-of-entry system for long term illnesses can be, without drawing profit, while we all are living longer and have a larger older population to finance out of the tax system. Although Lord Crisp’s work is fine to read, this is not quite the text to give a full critique or comment on today’s reforms. It is purely a reflection, a personal account. Yet the author does not leave out criticisms of himself or his own work, and takes care to show how he learned from these. This is the book of a proud man, and that is no bad thing at all, because he knows as we all do that the NHS is treasured. He does wink and nudge at a critique of the current administration’s handling of the NHS when he says there has never been a time when we did not feel, as a country, vulnerable to the notion that the NHS is slipping away from us. But with Ed Miliband recently warning about the time we have left to prevent damaging reforms from happening, and with respected Tory bloggers even calling time on the Lansley changes, we can’t be too sure whether we are still 24 hours away from saving the NHS. This review was first published on the LSE British Politics and Policy blog on 12th February 2012. Carl Packman is a health researcher, writer and blogger. He has written for the New Statesman, the Guardian, Tribune Magazine, The Philosopher’s Magazine and the International Journal for Zizek Studies. He is a blogger at Liberal Conspiracy, Though Cowards Flinch and he tweets as @carlraincoat. Read more reviews by Carl.